Today marks kind of a significant milestone, in my opinion anyway. We are at 31 weeks, which means we only have nine weeks left! Single digit number of weeks!! I just think that's so crazy. A couple of noticeable changes within the last week or so. One, my upper back, like up between my shoulder blades, hurts if I sit for too long. It always starts around 2:00 in the afternoon or so, and the only way I can make it not hurt is by laying on the floor. It's annoying. Second, my appetite is starting to come back! I think I may have lost a little weight on vacation (on accident) and because of that, it seemed like I hadn't been gaining any weight since we got back from New York. Thankfully though, I weighed myself yesterday and the number has gone up (never thought I'd be thankful for that). And even better, I want to eat now! And I actually find myself wanting ice cream, the thought of it doesn't repulse me anymore, which is a huge bonus. We're on the home stretch! And so excited!! Last weekend we went to Idaho Falls for my cousin's wedding. 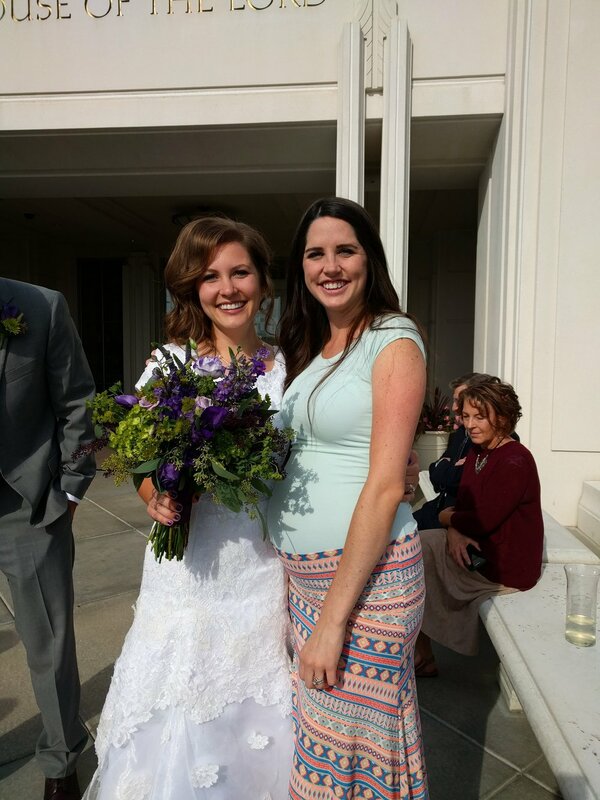 It was such a great day, and I'm so happy for her and her new husband! He's really great, and the four of us get along so well, I'm excited for us to hang out all the time and travel together. It was a quick trip for a day full of wedding festivities, but it was really a great celebration. And it was nice to have time with family too. 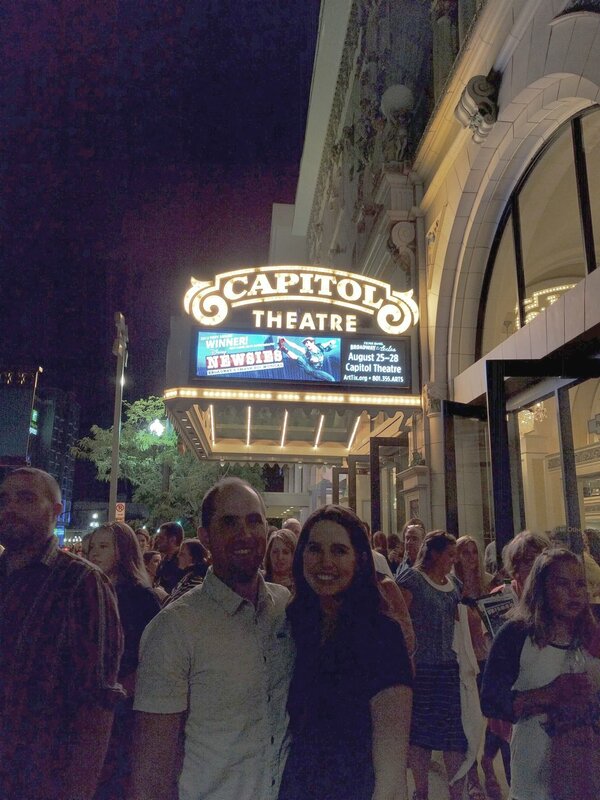 We got back from Idaho Falls Saturday afternoon, just in time to clean the house a little bit, then head downtown for dinner and Newsies with Brandon's family. I was so impressed with the play! This weekend we are headed to Lake Tahoe to see my little brother get married!!! They are having the ceremony right on the beach, and it's just going to be beautiful. I really am so excited!! It will be a long drive (especially if I have to stop and go to the bathroom as much as I do at work), but so worth it. This will be weekend #2 of our crazy busy weekends, and we're looking forward to every second of it! Update: First random craving of the whole pregnancy. You know the popcorn seasonings? One of the movie theaters in Boise has (or at least they used to) a whole slew of them, and I just want to go stand over them and inhale deeply. Brandon told me he would buy me a package so I can just lick it, but I swear I won't stoop that low. So gross. So random.